This is the nymph of an assassin bug known as the Masked Hunter, Reduvius personatus. It’s alive and healthy and is looking just as it should. 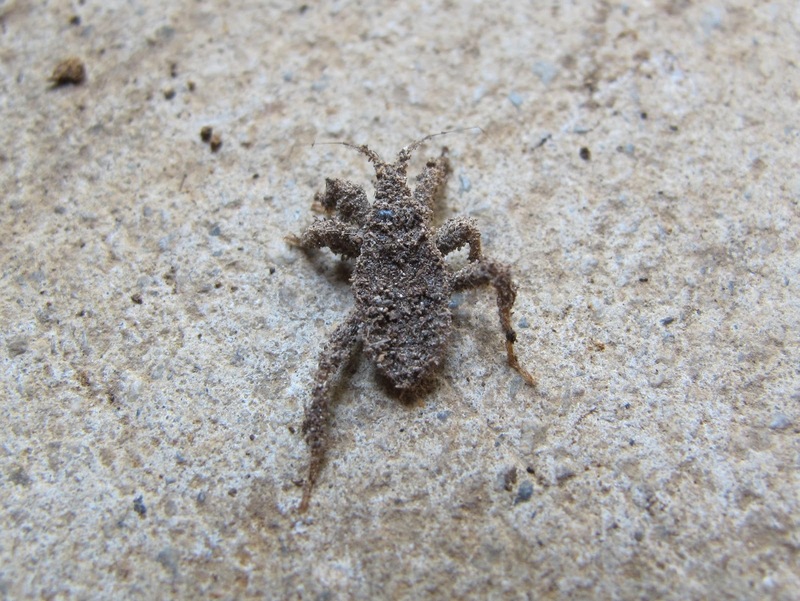 The predatory bug excretes a sticky substance that traps dust and debris. The result is a highly effective camouflage and an odd looking bug. I first found this non-native insect many years ago while I was sweeping the concrete floor of my barn. Before I could get the dust pan in position to collect the pile of dirt, several lumps crawled free and took off across the floor. Until I learned the truth, I believed that their dust covered condition was a result of being swept up, although it seemed odd that they would end up so completely covered. The Masked Hunter preys on a variety of small insects and other similarly sized arthropods. The fact that Bed Bugs are near the top of its list of favorite foods makes people believe that the presence of the Masked Hunter indicates a Bed Bug infestation. This may be true if you keep finding them in your bedroom, but they are most often encountered in barns and other outbuildings. In those locations, the Masked Hunters may be feeding on other Bed Bug species or one of the many other prey items they are known to consume. I’m normally unhappy at the presence of non-native species, but this one seems to confine itself to man-made structures and that just doesn’t seem quite as bad. I don’t know if the dust covering just naturally accumulates as the bug travels around its preferred habitat or if the bug actually applies the bits to its body. Whichever the case, the process must be repeated after each molt. The use of debris camouflage ends when the bug reaches the adult stage. I’ve seen the shiny black adults, but it took me a while before I realized that they came from the dirty nymphs. 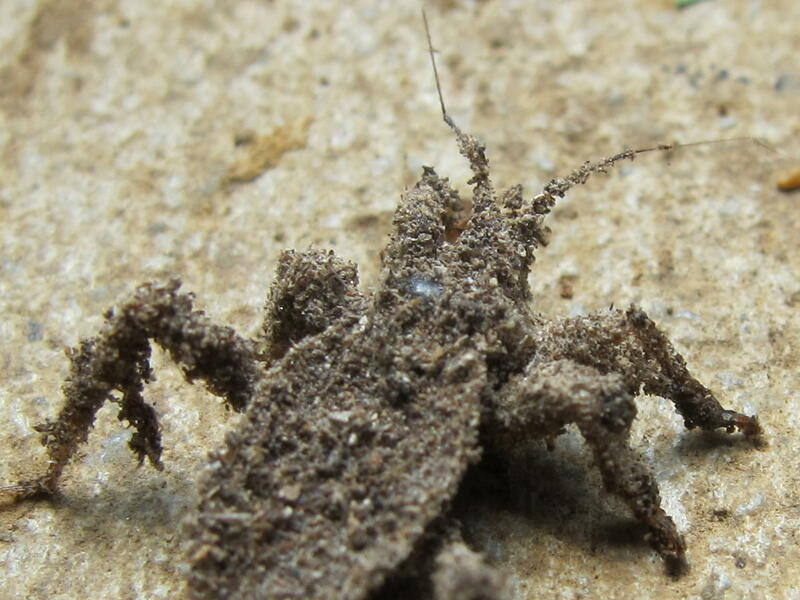 It seems that the dust covering would hinder the bug’s sensory abilities. This is apparently not the case since it will seek cover at my approach and its continued presence is evidence that it is an effective hunter. 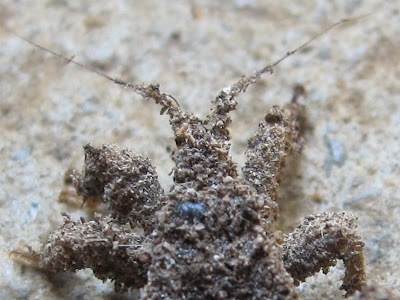 Like many other Assassin Bugs, this one is said to inflict a painful bite if mishandled. I’ve chased a few onto my hand without incident, but I’ve since stopped doing that. Most insects will walk on your hand without biting or stinging if they are allowed to move freely. It’s when you close your hand or otherwise restrict them that they are likely to defend themselves. There have been enough times when innocent appearing insects have just given me a bite that I no longer offer the really painful biters that opportunity. I don’t imagine that I’ll ever eliminate dust and dirt from the barn, so these guys ought to be around for a long time. Reminds me of Pigpen. Remember that character from the Charlie Brown (actually Peanuts) comic strip. Hi Mark. 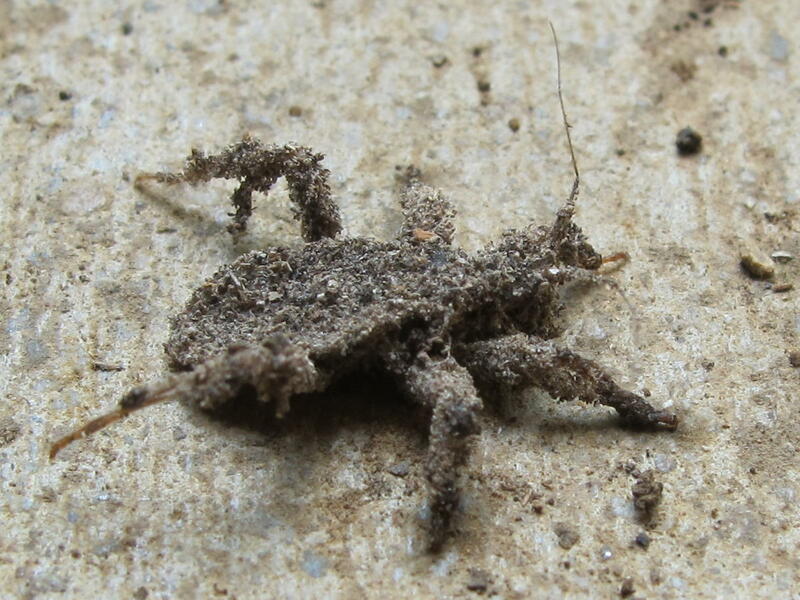 I also thought of Pig-Pen when I saw this bug. My favorite Pig-Pen strip showed him being followed by Violet as he walked down the street. He was clean in the first frame, but by the last frame he was back to his normal dirty self. Violet claimed he was the only kid she knew who could get dirty just walking down the street. I love the Pig Pen analogies. Very funny. I had no idea this bug existed, thanks for the post and photos. Hi Ingrid. Glad you enjoyed the Pig-Pen bug. Which is worse? These assassin creepies, or bed bugs? I found one of these guys in my basement a year ago. They're kind of cute, and I figure they are like spiders - taking care of the bugs I don't want. 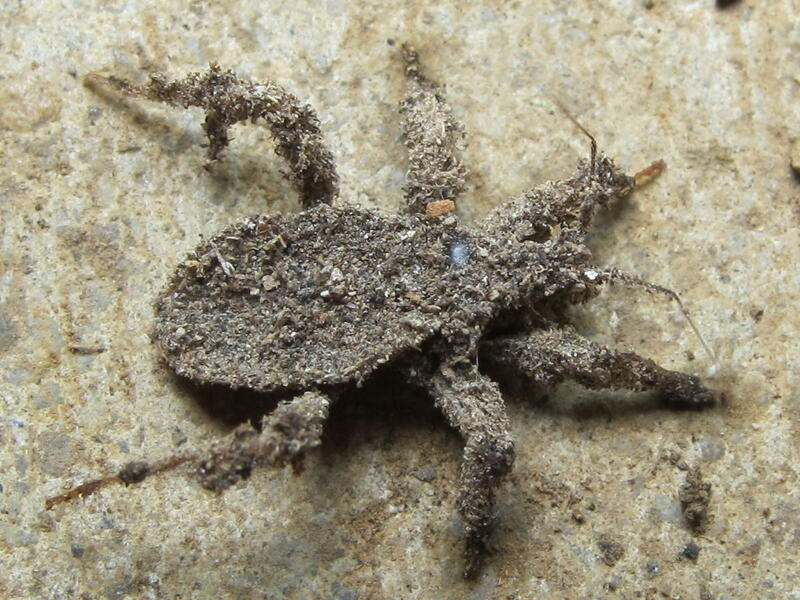 I just found a funny insect in the furnace room that I thought might be the adult, which is how I found your site. The adult kind of slowly lumbered around, which I found endearing for an insect (not creepy fast like house centipedes!). Well, off to continue searching to confirm my find. I remember seeing one of these when I was cleaning my den. I was very disturbed at first but then intrigued. I'm glad I figured out what it is. Very strange indeed. Hi, Jessica. Whenever I see one, my first thought is that I should help the poor thing get cleaned off. Thanks! I thought it was a dirty spider.... only 6 legs was throwing me off, saw this, not so worried now! Do these things feed on ants? I assume so because I found one hanging out beside an ant trap in the kitchen. Hi, Andrew. I haven't seen any documentation of these bugs eating ants, but it seems likely that they would eat at least some species of ants. Just found one today in a box of clothing. I had no idea what it was, but I've got it in a container to watch for awhile. I suppose I should set it free at some point. Maybe in the barn? It would probably do well there. I saw one on the carpet in the outside carpet in the hall in my apartment. I shook it outside. I don't have to worry about bed bugs right? These bugs feed on a variety of small creatures, so finding one does not necessarily indicate the presence of bed bugs. That doesn't mean that your building or apartment is free of bed bugs. Like mice or cockroaches, bed bugs are just one of those things you have to keep an eye out for. Thanks was scared for a moment. I live near a bunch of trees so see a lot of different bugs. That's amazing. You were fortunate to witness the event. I wonder if the spider came out to capture the bug and then wound up as the bug's dinner. Thanks for sharing the story.